Why Is This Deer Dangling From a Power Line? East Missoula, Montana wins the award for the weirdest power outage from natural causes. According to the AP report, an eagle may have bitten off more than it could chew and dropped the fawn when it was flying away with its prey. 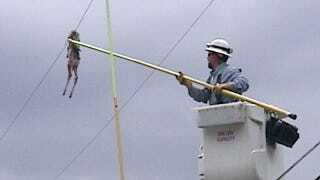 The "deer with wings" got hung up on the power line and caused the lights to go out in a local neighborhood.